TEST AVAILABLE MONDAY TO FRIDAY, TO PRE-BOOK OR FOR FURTHER INFORMATION PLEASE TEXT TO THIS NUMBER 0434 506701. TEST FEES MUST BE PAID PRIOR TO BOOKING. WE CAN NOT GUARANTEE BOOKING UNTIL FEES ARE CLEARED. PLEASE QUOTE FAB 18 TEST TO RECEIVE YOUR DISCOUNT. 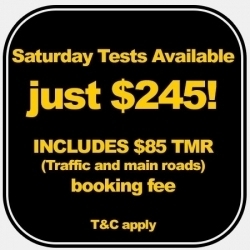 SATURDAY TEST ARE AVAILABLE PRE BOOKING ESSENTIAL.